According to this article in the Post the Nats are drawing only 9,000 viewers a game for their televised games. That is pathetic. The Kansas City Royals, perennial losers, draw 28,000 a game as the next lowest team. I know the Nats are new in town, I know it takes awhile to build a solid base, but I still think the team isn’t really trying. I missed this incident during the weekend series with the Pirates, sounds serious. We can only hope this convinces them to more careful in the future. Nationals Park, originally uploaded by gleefulgecko. OK, I did the Orioles the other day now it was the Nationals turn for a great baseball game. The game was great, tied 1-1 into the 12th when the Braves went up 2-1, The Nats came back and won the game 3-2. Very fun. My first trip to the new stadium and I think it is pretty nice. Easy walk from Metro, good seating layout and overall a nice feel to the park. It was pretty quiet, it was an afternoon game with a smallish crowd but everyone seemed to pull for the team and we got to see the Braves fans leave early after their pitcher walked in the tying run in the 12th. Ballpark food was pricey and the service was pretty poor, but hopefully they will get better as the season goes on. I was unaware of how difficult is really is to get a hot dog into a bun, apparently a team of three was needed. Who knew? Overall I still prefer Camden Yards, but I have to say Nationals Park is pretty nice. Thanks to John and Mattie for having Charles and I along. 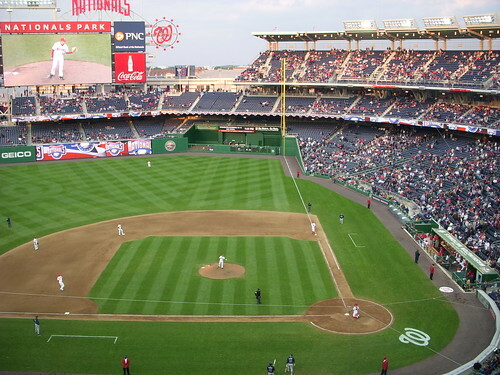 David Gorsline at pedantic nuthatch points to the new DC Baseball Stadium designs. He thinks they didn’t think about the baseball as much as they should have, I don’t know, I am pretty neutral on the design, doesn’t excite me one way or another. I am looking forward to trying to get to some Nationals games this year though, I am still mostly an Orioles fan (pity me) but the Nats are too close and easy to get to for me to pass up.